La Zagaleta is one the most well known and exclusive residential complexes in the south of Spain. It consists of 400 villa plots, prices starting at €3 million. Before it was purchased by the La Zagaleta Group, it belonged to the Saudi Arabian businessman Adnan Khashoggi. La Zagaleta property is guaranteed luxury living. This estate stands out from all the other residential developments as it features a heliport, a lake, two golf courses, a member’s clubhouse as well as an equestrian club. It is very well connected as the International Airport of Malaga is nearby. Within ten minutes you can reach Marbella and enjoy its beaches and praised restaurants. Initially, the group was allowed to build 3,000 villas, but they decided to value quality over quantity in order to provide an outstanding environment for the wealthiest people. The average price for villas on La Zagaleta property market hovers around Average price per sqm. in La Zagaleta €6,466 -1% properties#: 72 last change on: 19 Apr 2019 €6,466 per square meter, what makes it one of the most expensive areas on Costa del Sol. Highly appreciated views over the golf course raise the average price. For apartments, the average is Average price per sqm. in La Zagaleta €3,675 -9% properties#: 2 last change on: 19 Apr 2019 €3,675 per square meter. As for investment opportunities, the average is currently Average price per sqm. in La Zagaleta €5,063 0% properties#: 4 last change on: 19 Apr 2019 €5,063 per square meter. The most notable real estate agencies on La Zagaleta property market are Private Property, Diana Morales (Knight Frank) and Prestige Property, with the highest number of bids in the area. From may May to August you can enjoy more than 300 hours of sunshine per month and refresh yourself in the pleasantly cool sea. The warmest months are July and August with average temperatures of 25 degrees Celsius. From January to February the temperatures drop to a still convenient average of 14 degrees Celcius. Nothing comes close to La Zagaleta when it comes to privacy and exclusivity. Lying on 2,200 acres of green beauty, it overlooks the town of Benahavis. It gained the reputation of being one of the world’s most expensive developments, and that for a reason. Plots located in prime locations alone can cost more than ten million, only the wealthiest can afford to acquire a La Zagaleta villa. People that have concerns about safety can sigh with relief. Armed Security guards, CCTV, as well as a barbed-wire fence, protect the enclave around the clock. There have been lots of rumours about who owns property there, but it is hard to confirm these as La Zagaleta values the privacy of its residents. Vladimir Putin, Rod Stewart and Hugh Grant are said to have lived there. However, if one really wants to find out who resides inside the privileged walls, one does not come around buying a La Zagaleta Villa. While the development is secluded for good reasons, it does not mean its residents are living completely withdrawn. The busy and vibrant hotspots of Marbella and Puerto Banus are just a stone’s throw away and offer a huge variety of restaurants, bars and clubs. Marbella hosts the highest concentration of Michelin-star restaurants in the whole of Spain, while Puerto Banus hosts the most impressive variety of yachts. The clubhouse, which used to be the residence of Adnan Khashoggi, is the social hub for the residents of La Zagaleta. It consists of 5,000 square metres of surface area and features a huge variety of amenities. 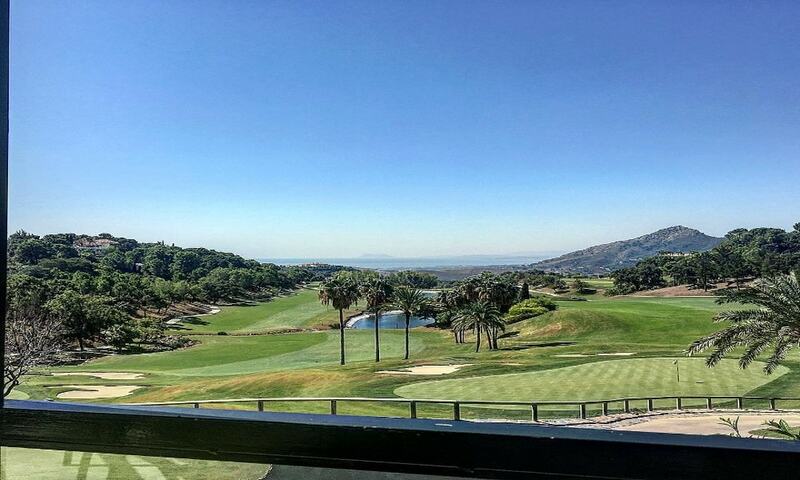 Golf enthusiasts will enjoy the courses set in a sublime environment, boasting views of the Alborán Sea and Gibraltar. Both of them are exclusive so waiting queues are non-existent. La Zagaleta is home to the rich and famous. When you buy a property in this luxurious complex, you not only acquire property, you buy yourself into a most exclusive community. Your neighbors value privacy as much as you do, while the clubhouse and surrounding towns offer plenty of possibilities to socialize. Combining luxury, privacy and sophistication, a La Zagaleta villa is the ultimate property.